McDonald’s Corporation MCD declared a 15% hike in its quarterly dividend to $1.16 from $1.01 a share. The dividend will be paid on Dec 17, 2018, to shareholders on record as of Dec 3, 2018. Total fourth-quarter dividend payout is estimated to amount to $900 million. Notably, the company has a history of increasing dividend almost every year since the inception of its dividend payout policy in 1976. Last September, McDonald’s raised its dividend by 7.4%. Prior to that, it had increased the quarterly dividend by 7%, 6%, 5%, 5%, 10% 15% and 11% in 2017, 2016, 2015, 2013, 2012, 2011 and 2010, respectively. The company’s capital allocation flexibility has increased owing to change in its business model and tax laws as well as Jobs Act of 2017. People looking for regular income from stocks are most likely to choose companies with a track record of consistent and incremental dividend payments. In the second quarter, the company paid dividends of $786.1 million, reaching the total dividend amount to $1,600 million as of Jun 30, 2018. Additionally, the company repurchased 10.4 million shares for $1,700 million, reaching total purchases for the first six months of 2018 to 20.8 million shares valued $3,300 million. Meanwhile, the company expects to return around $24 billion to shareholders for the three-year period ending 2019. We appreciate McDonald’s’ efforts to consistently enhance shareholder returns despite the sluggish economic condition of some of its major international markets. This reflects the company’s business strength and sustainability of significant cash flows. McDonald’s shares have gained 1.2% against the industry’s rise of 6.1% in a year’s time. However, we believe that the recent hike in dividend will help the company attract investors which in turn is expected to facilitate earnings growth. The company said it has a long-term target beginning 2019 for system-wide sales growth of 3% to 5%, earnings per share growth expectations of high single digits, ROIIC in the mid-20% range and operating margins in the mid-40% range. 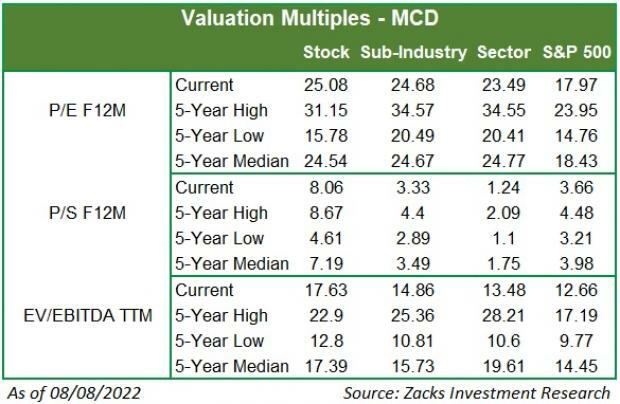 McDonald’s carries a Zacks Rank #3 (Hold). Some better-ranked stocks in the industry are Chanticleer Holdings, Inc. BURG, Darden Restaurants, Inc. DRI and Dine Brands Global, Inc. DIN, each carrying a Zacks Rank #2 (Buy) .You can see the complete list of today’s Zacks #1 Rank (Strong Buy) stocks here. Chanticleer Holdings has an expected earnings growth rate of 12.9% for the current year. Darden Restaurants reported better-than-expected earnings in the trailing four quarters, the average beat being 3.1%. Dine Brands Global reported better-than-expected earnings in the last four quarters, the average beat being 8.1%.